If you&apos;ve so much as taken a photograph in your life, or picked up a magazine, chances are you&apos;ve heard of Annie Leibovitz. Her iconic photography, often of celebrities, has graced the covers of innumerable magazines. And now, the first-ever full exhibition of her Master Set is on display at the Wexner Center for the Arts in Columbus! Filling the entire gallery space, this exhibit is outstanding. If you&apos;re coming within 100 miles of Columbus, you won&apos;t regret a detour to see it. 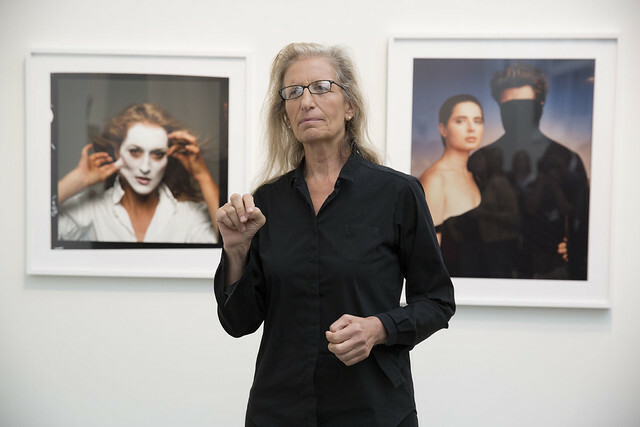 Leibovitz has chosen three components for the show. The first, the Master Set, consists of 156 images she selected a few years ago as the definitive edition of her work, drawn from the thousands of professional assignments she has had over the years and augmented by more personal images of her family. Also on view are images from the Pilgrimage project, featuring a series of photographs of interiors, landscapes, and talismanic objects attached to historical figures—Abraham Lincoln, Ralph Waldo Emerson, Emily Dickinson, Georgia O’Keeffe, Annie Oakley, and Elvis Presley, among others. Finally, a special lobby display features portraits and related working prints taken by Leibovitz of artists who have appeared at the Wex over the years. The exhibit is only on display until Dec. 30 - so don&apos;t wait too long! If you&apos;re looking for a gift that will last through a whole year, think about giving a Wexner Center membership. Through Dec. 31, you can get a buy-one-get-one-half-off deal on memberships. For as little as $75 dollars, you can get a household membership (which itself covers two people) for yourself and one for a friend, and get a slew of membership benefits (including free admission to exhibitions as often as you wish) for one full year. While you&apos;re at the Wexner Center, make sure you check out Heirloom café - it has extended hours through the run of the exhibition (till 8 p.m. Thursdays and Fridays and is open weekends, too, making it a great stop for a bite to eat or to grab a hot drink. And if you&apos;re looking to do some holiday shopping, the Wexner Center has a fantastic store. You can order an autographed copy of one of Leibovitz books (Pilgrimage, At Work, American Music, A Photographer&apos;s Life, and Women, written with Susan Sontag), and they will arrive at the store in time for Christmas. We&apos;re giving away FOUR tickets to the Annie Leibovitz exhibition at The Wexner Center for the Arts! To enter, follow Experience Columbus and the Wexner Center on Pinterest, pin the image in this post and use the hashtag #expcols in your description. If you’re not on Pinterest, you can also enter by commenting about why you want to visit The Wexner Center for the Arts!